Hope Douglas ran Wind Over Wings for 29 years and recently reflected on life the lessons that can be learned from birds. DRESDEN — Hope Douglas was never especially interested in birds. A blind red-tailed hawk at a nature center in Florida changed that in an instant. That bold, beautiful bird, healthy in every other way, was beautifully calm even though it had lost a vital sense. “It was a startling realization that this raptor who lived by sight could adjust to something so foreign to its nature,” Douglas said. In what she called that pivoting moment, she decided to leave her work as executive director of a nonprofit counseling and adoption agency to bring birds to people who might have the same kind of experience in learning adaptability. Now Douglas, 70, is pivoting again. 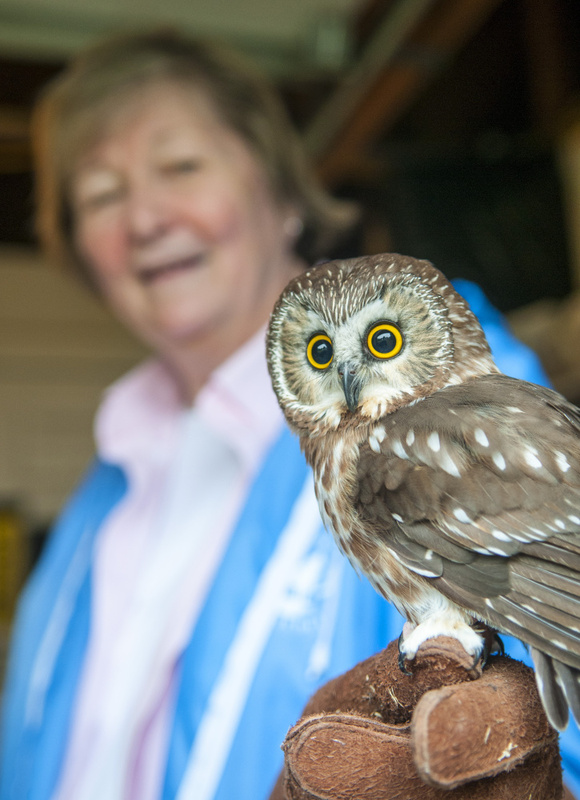 On Saturday, she’ll take the last six birds under the care of her educational nonprofit Wind Over Wings to new homes, and she will retire after 29 years. 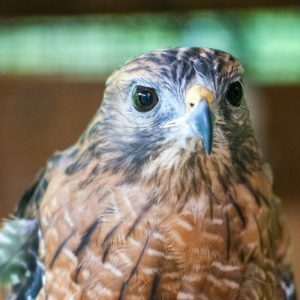 The red-shouldered hawk and the Eastern screech-owl will go to Horizon Wings Raptor Rehabilitation & Education in Ashford, Connecticut, where two golden eagles have already been taken. Two saw-whet owls, a great horned owl and a raven will go to the Audubon Society of Rhode Island in Bristol to join two red-tailed hawks already there. 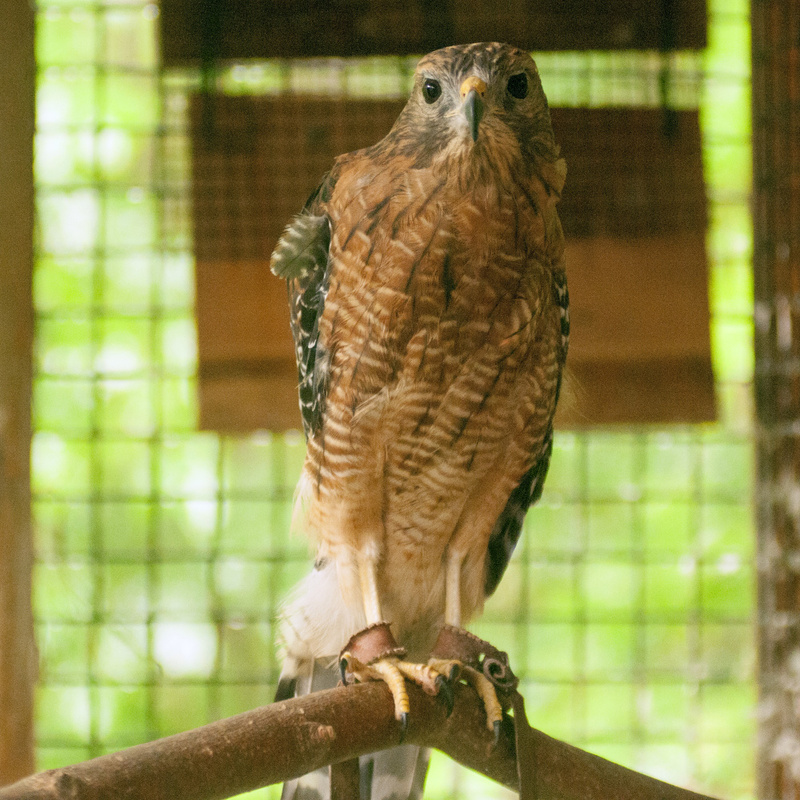 Two kestrals have already been resettled, one at Christine’s Critters in Weston, Connecticut, and one at Blue Moon Raptors in Guilford, Connecticut. Earlier this summer, Douglas and several volunteers brought several Wind Over Wings birds to Dresden SummerFest, an annual town celebration at the Pownalborough Court House. Each carried a bird perched on a leather glove clad hand secured by jesses attached to their legs. A sit-down program had been planned, but because people favored walking around, Douglas and her volunteers also walked around with the birds. They stopped to answer questions and give people a close-up look at a raptor and a little of their stories. Some people were fascinated, others were visibly scared. They are also unfazed by the kind of attention and interaction at the summer festival. All of the birds under her care have been working birds, Douglas said. If they weren’t suited for programs and didn’t like the interactions, she would find them new homes. “If they hate their life, it’s not the life for them,” she said. A red-shouldered hawk named Cessna sits in her aviary Friday at Wind Over Wings in Dresden. When Douglas made the shift in 1988, she was already well-versed in the world of nonprofits. As executive director of Child and Family Agency of Southeastern Connecticut, a 501(c)3 agency, she made good use of her master’s degree in counseling and education, and she understood fundraising, working with a board of directors and how to make all the parts fit. She left the security of a regular salary and benefits during a recession to nothing. “That was a very scary move, but it was somehow important to do it,” she said. As she made the shift, Douglas and her volunteers worked through all the tasks that needed to be done, from raising money to putting on programs and caring for the animals under her supervision. 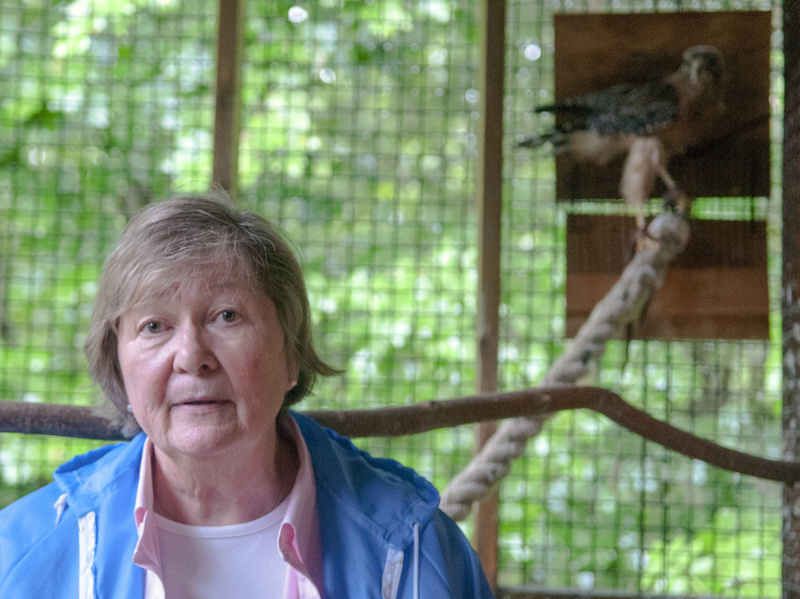 When Douglas started, she was both a wildlife rehabilitator and an educator in Connecticut. The thread that connected that work to her previous work was education and children. She went from working with children to working with rescued birds to educating children with the rescued birds. It was, she said, a challenge to be at a program at a park across the state, while being responsible for feeding the baby birds at home. She eventually gave up rehabilitation and focused on the education, doing about 300 programs a year. Because most birds are migratory, they fall under the protection of the federal government, and government permission is required to care for them. Caring for them is a challenge. Feeding the birds can cost about $1,000 per bird per month, and she has had as many as 20 at a time. Traveling is also a challenge because caring for raptors is not at all like watching dogs or cats. It’s a mistake to picture the birds as pets. Very little contact takes place between the birds and the humans who work with them. Other than the days when their talons are trimmed, the only contact between bird and human is the volunteer’s leather glove. “She’s a calm and meticulous person,” Sue Barker said. Barker met Douglas about five years ago through an adult education program Douglas did in Bath. One night a week for six weeks, Douglas put on programs, each time with a different bird. Not long after, Barker signed up to volunteer. One of those things is her retirement. When Douglas relocated to Maine eight years ago, she was well settled into the work of Wind Over Wings. The pace in Maine was slower and the roster of education programs settled in at about 140 a year. They were arranged by mostly word of mouth, on the recommendation of someone who had seen a program. Other educators talk about natural history or migration patterns, but Douglas has taken another tack. One of the most powerful lessons the birds can teach is how to cope when circumstances abruptly and unexpectedly change. Many of the birds under Douglas’ care are not fully flighted. They have sustained some kind of injury from which they did not heal well enough to be released. 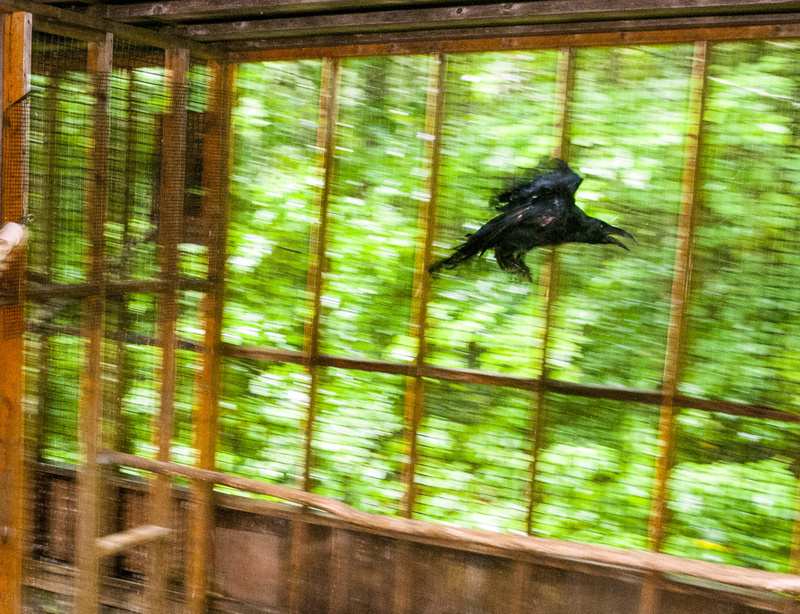 The raven, Zachariah, fractured his wing as a young bird, and now he can’t fly more than a few yards from perch to perch in his aviary. Cessna, the red-shouldered hawk, was hit by a vehicle and may have skidded on the ground. Her wing and tail feathers were damaged. While the tail feathers grew back, the wing feathers did not. Her aviary has ramps that allow her to get up off the ground and reach different branches and platforms. Some, not understanding glass, have sustained serious injuries after flying into windows. The exception is Queen Solomon, the great horned owl. She had fallen out of her nest and was raised by the woman who found her. Solly, now 21, doesn’t know how to survive in the wild, so she won’t be released. “I think it was her mission in life to help children and adults learn to put baby birds back in the nest,” Douglas said. It’s a myth that bird parents reject chicks that have been touched by humans, she said. The birds have many lessons to teach. About a decade ago, Douglas received a call from a rehabilitator in Nebraska, that was caring for a golden eagle that had been shot. Its wing had to be amputated. The bird was angry and was dangerous, she said. But the rehabilitator knew Douglas had experience with eagles, so after the requisite government paper work, the eagle named Skywalker found its way to her care. Her philosophy has been to never withhold food and to never tether birds when they are in their own aviaries. Every morning, after all the birds were fed, she would sit down on a stump in his aviary and read to him, book after book to get him used to the sound of a human voice. “After about two years, you could see that intense anger was starting to go away and curiosity was moving in,” she said. After two and a half years, Skywalker would voluntarily step up to the glove. During that time, Douglas was being treated for breast cancer, and spending time with the eagle taught her lessons she said she was hungry for. Skywalker made being calm about her cancer possible. Douglas brought him to programs for people who are in situations they didn’t choose, like cancer survivors and kids enrolled in alternative high schools. 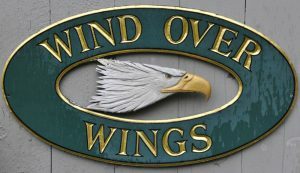 Wind Over Wings in Dresden is closing on Saturday when owner Hope Douglas retires. When Douglas wakes up on Monday, she’ll have her pick of things to do. “I will probably adjust to the fact that there’s nothing to feed,” she said, except the dogs, cats and parrots who live with her. The aviaries will be silent and she’ll have time to explore all of her interests. In that silence will echo the stories she’s collected from her career as a wildlife educator. In each of her newsletters, Douglas has included letters from children whose schools she and her birds have visited.